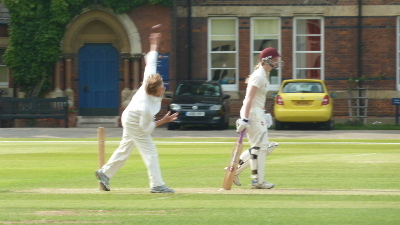 Ironically in a regular fixture that has started to so successfully promote girls’ cricket in this part of Essex, it was the bowling performance of England Women’s cricket legend and septuagenarian Enid Bakewell that caught the eye as a strong MCC Women’s side defeated the Felsted School Girls’ team by 40 runs in June. In last year’s inaugural match, it was decided to ‘mix and match’ the teams to ensure parity, a policy that worked well despite some early glitches that saw MCC Captain Beth Wild return from winning the toss to realise that she had done so against her own opening batsman. A close finish resulted however, and so it was decided to follow the same policy this year, all conducted in an open and friendly way without the need for lining players against the playground wall (an ordeal which some readers may have endured in their younger days – as did this writer). Winning the toss, the MCC Women combination XI chose to bat, but suffered an early reverse when Essex Girls’ Nancy Hebron played across the line and was bowled. 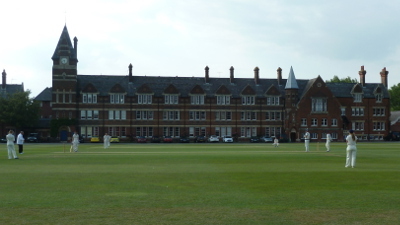 Some early innings tremors were steadied however by a 3rd wicket partnership of 64 between Georgia Hennessey (Worcestershire) and Lucy Stuchfield (Oxford University). At 71-2 off 11 overs, MCC looked set fair for a sizeable total, but a tidy spell of 3-17 off 5 overs from Dani Lavender put the brakes on somewhat, coupled with the retirement of Hennessy after making a well-compiled 51 off 47 balls. It was left to Beth Wild and New Zealand international Rachel Candy to take the MCC to an impressive, but not unbeatable, 154-8 off their 25 overs, with Alex Straker-Nesbit tidying up the tail to finish with 4-20. The Felsted combination XI needed a strong start, but the early loss of Berkshire’s Carla Rudd during an impressive spell from the School’s Kieri Samaranayake was a blow. Nevertheless, at 41-2 off 11 overs, a target of a further 114 off 14 overs was tough but still possible. Then Enid Bakewell got to work. Bowling slow left arm with impressive flight, two wickets followed in her first over as several of the School’s girls found themselves beaten by Enid’s guile. Some hushed conversations were overheard on the boundary’s edge as several returning batsmen expressed surprise at the slowness and loop of the bowling – to which of course could be added ‘straightness’. A third wicket followed with a smart catch by Beth Wild at point, and although there were some late flurries from Felsted’s captain for the day Salliann Briggs, and Beth Absolon of Suffolk, who finished with an impressive unbeaten 44 off 46 balls (including 10 boundaries), MCC eased to a 40 run victory as the School closed on 114-8. An enjoyable afternoon’s cricket, but no doubt who the star turn of the day was (in my opinion anyway). Pausing to thank the officials, Enid reminded us of her age before making her way to the changing room. Well played indeed – if I’m still scoring after 50+ years in the game (let alone playing) then I’ll be more than happy. SPECTATOR HINT – for those visiting the School (and it’s a lovely venue, used by Essex Women on occasions) then we can recommend the sausage baguettes in the local tea rooms. I accept that’s not a useful pre-match tip for players however.